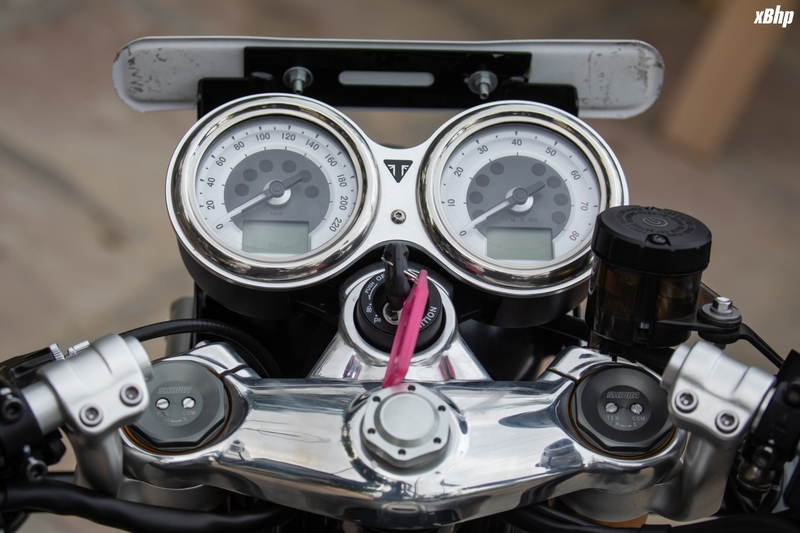 Strip a motorcycle down to the bare essentials, set the handlebars low and footpegs rearward and you’ve got yourself a café racer. 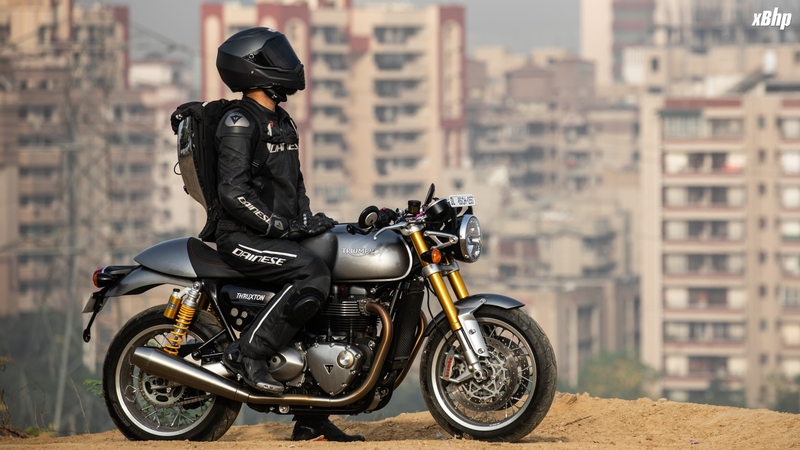 Now, to that motorcycle, add suspension finished in gold, twin reverse cone megaphone exhausts with a brushed stainless steel finish, some gold trim on the brushed aluminium-finish engine and some modern amenities, and you get what the world knows as a Triumph Thruxton 1200R. 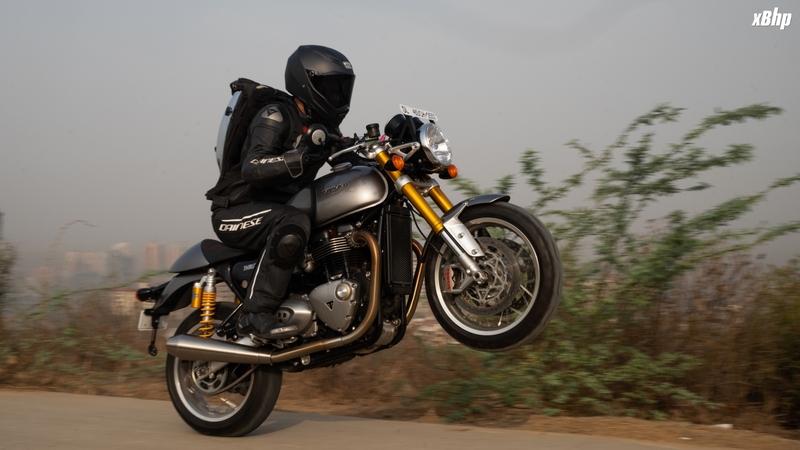 Triumph’s Thruxton 1200R belongs to their Modern Classics catalogue of Triumph. 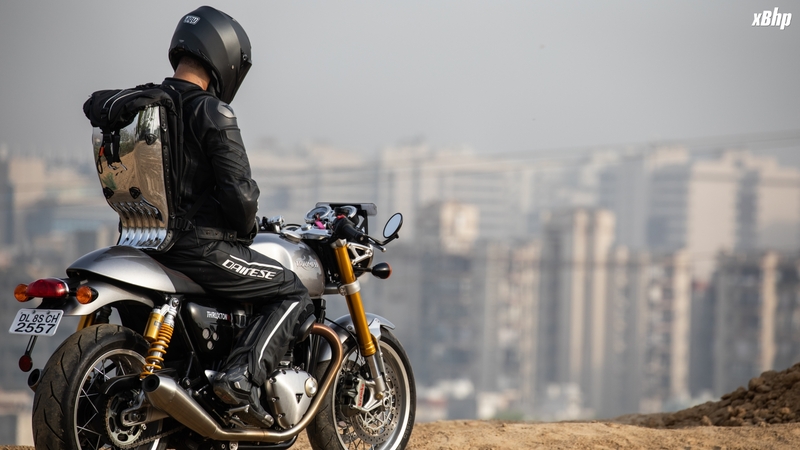 And it is justified by the fact that one look at the Thruxton takes you back in time and what brings you back, are the modern electronics and features that the bike has. The attention to detail is almost obsessive and an example would be the throttle bodies that are disguised to look like carburettors. All that trouble just to make sure that the ‘Classic’ tag remains valid for the motorcycle. The motorcycle oozes of old school charisma. 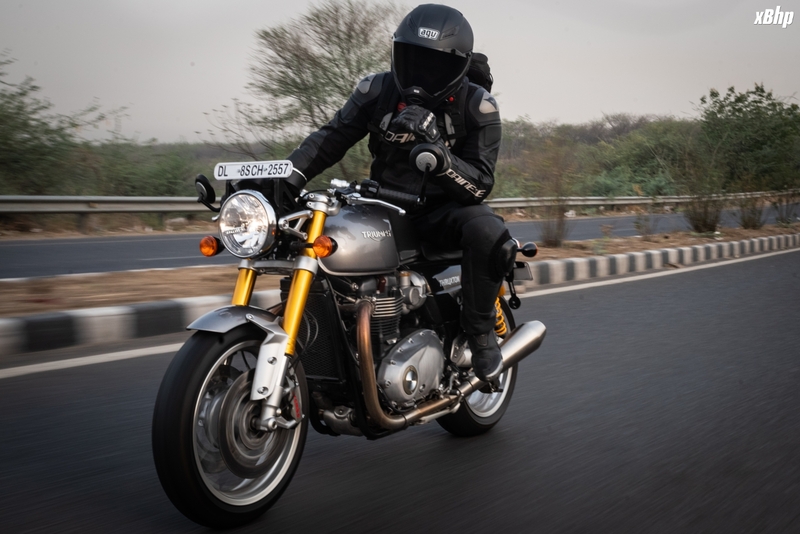 It is such an amalgamation of ‘Classic’ and ‘Modern’, it can make you feel like you are in the 60s and one short ride will bring you back to this time. It’ll leave you stuck in an infinite loop of timeline jumps, that’s how wonderful it is. 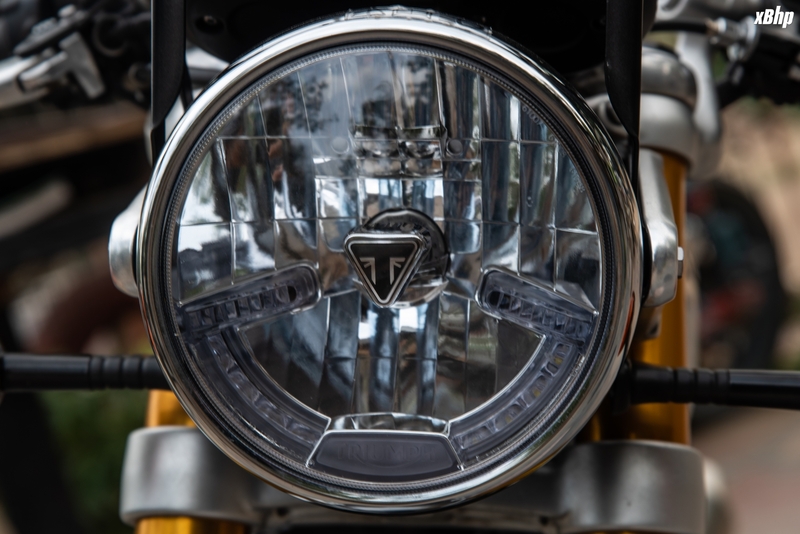 The classic round headlamp features an integrated LED DRL. 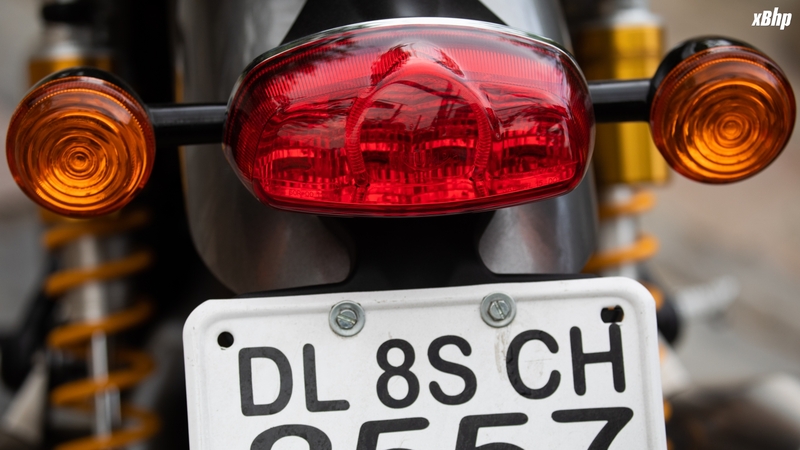 The taillight sports an LED despite justifying the classic styling. 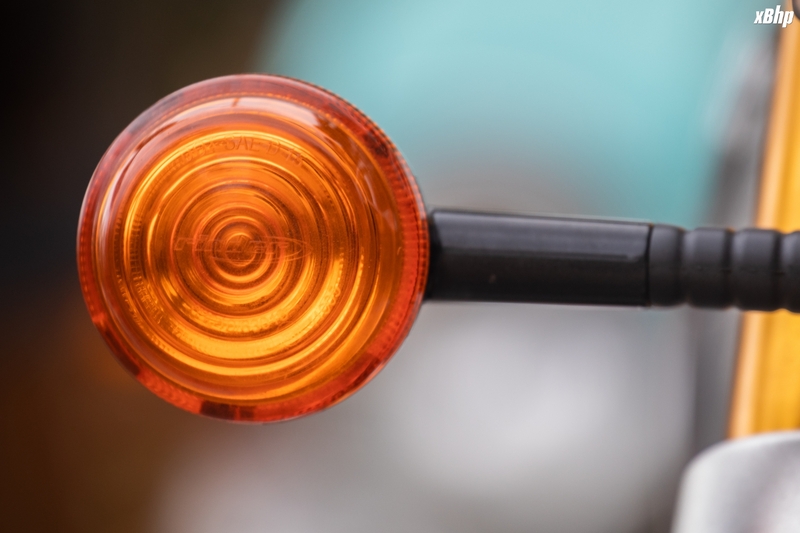 The turn signals look vintage. The twin pod instrument cluster that is NOT devoid of most of the modern tell-tale signs is as old-school as it gets. 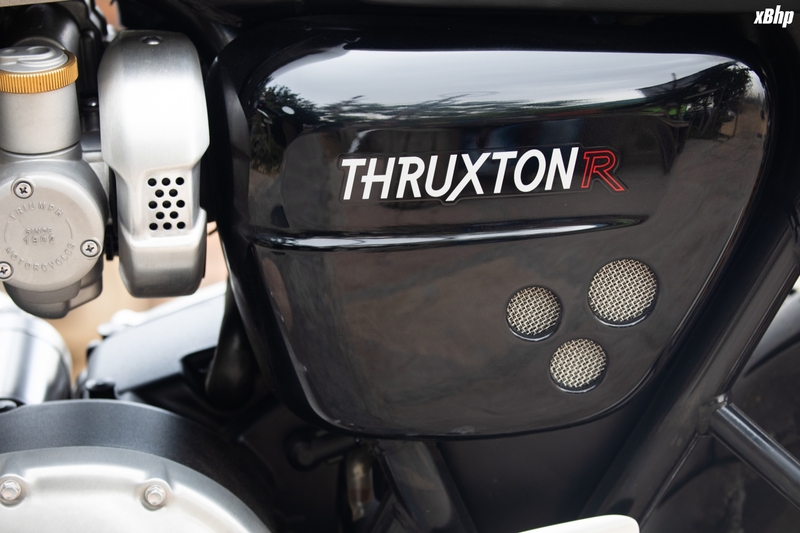 The side panels sport a Thruxton R badging. 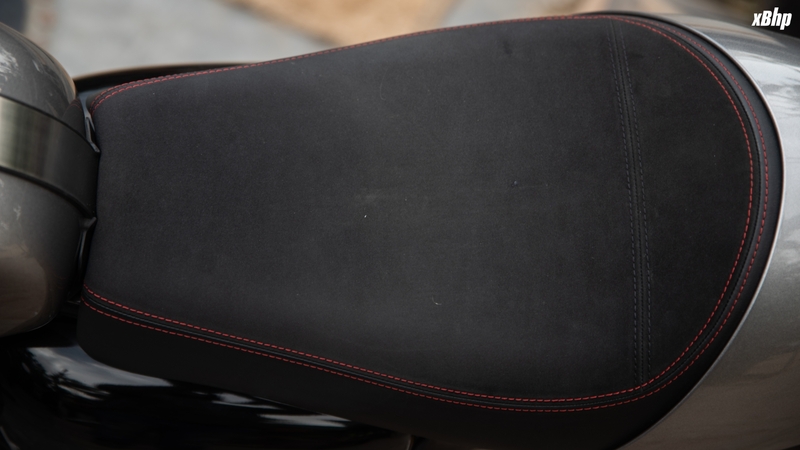 The black seat is accentuated by the red stitching. 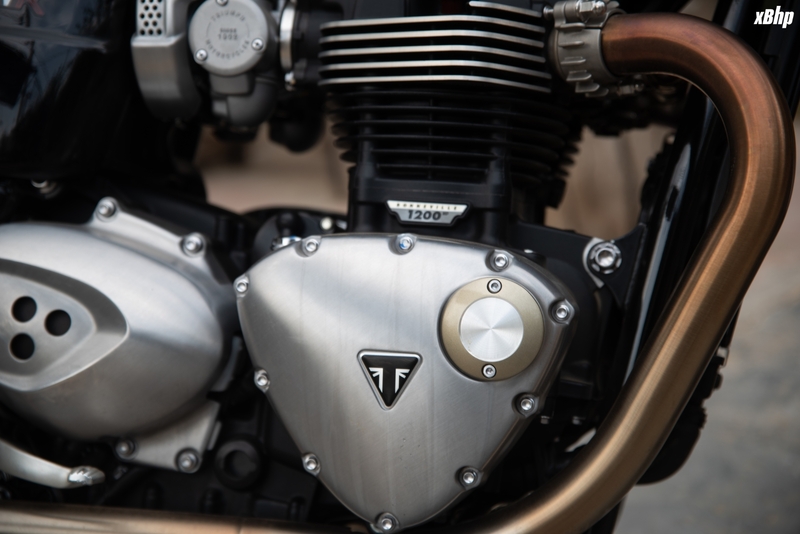 The engine is brushed aluminium with a Triumph badge. 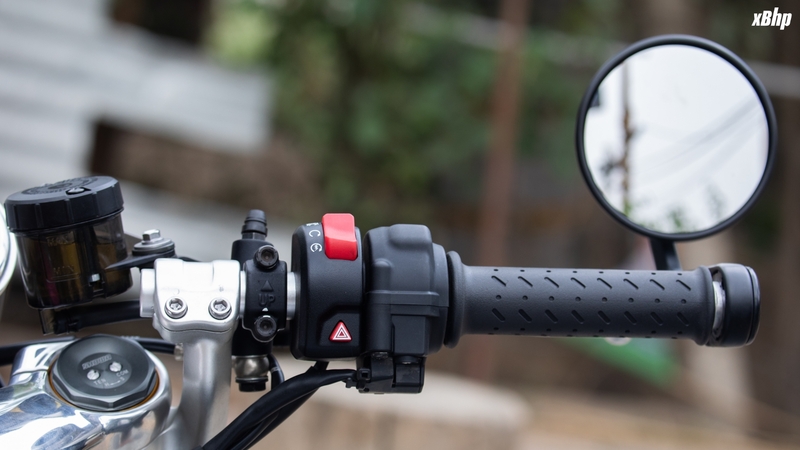 The handle bar is clip-on type with aluminium bar end mirrors. 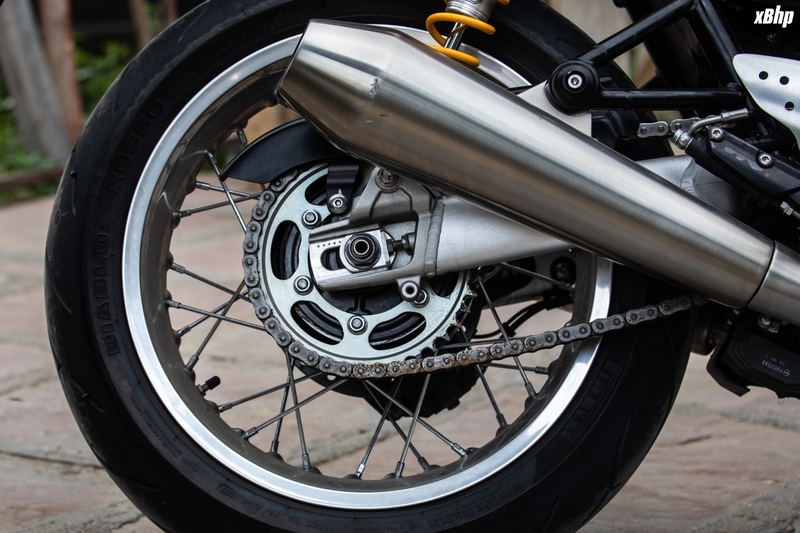 The classic spoked wheel rims and the swing arm are aluminium as well. It also gets a single bullet seat with a painted seat cowl. 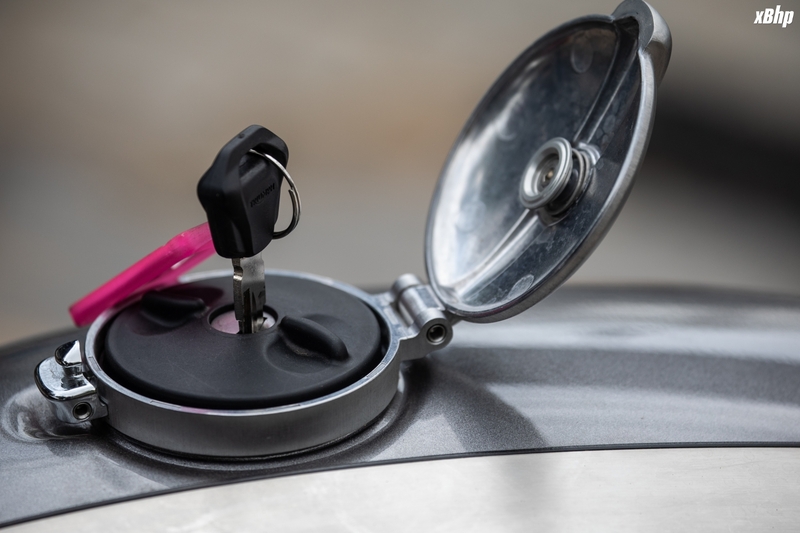 Even the fuel tank lid is flip up ‘Monza’ style, need we say more? I guess not, but the folks at Triumph say otherwise. 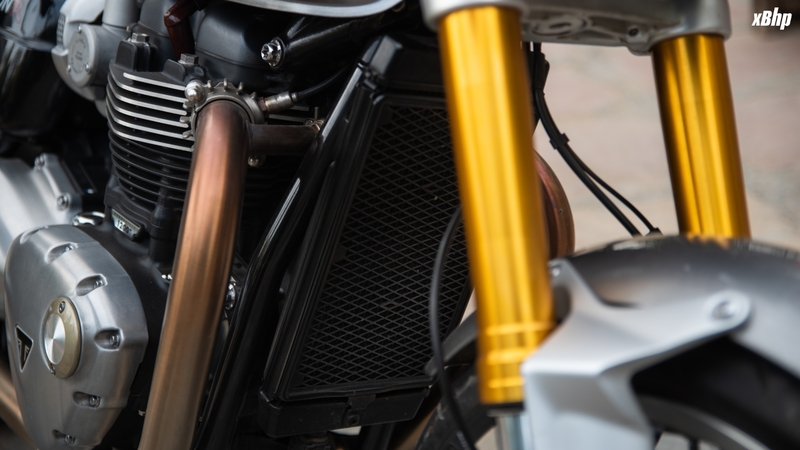 The bike also gets an optional track racer kit that features a minimal fairing around the cockpit, lowered handlebars, even more trimming of the rear known as a tail tidy kit and Vance & Hines slip-on exhaust. And… we are spoilt. 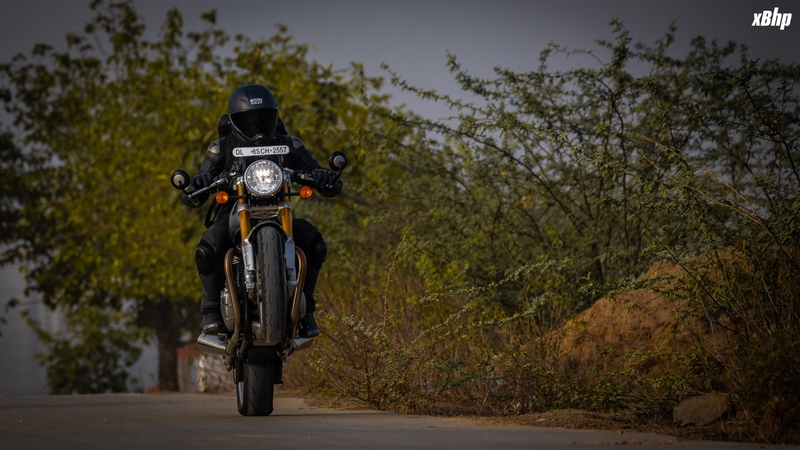 The bike is shod with modern electronics and features such as ABS, Ride-by-Wire with riding modes, traction control and a slip assist clutch. 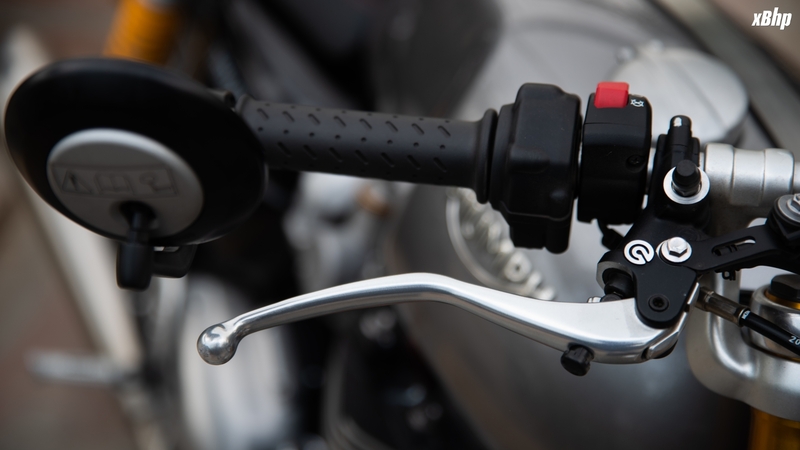 It also gets an engine immobilizer that integrates a transponder in the key of the bike which in order is linked to the ignition system. It prevents the engine from running if the correct key is not used. An under seat USB charging socket is also present because why not. 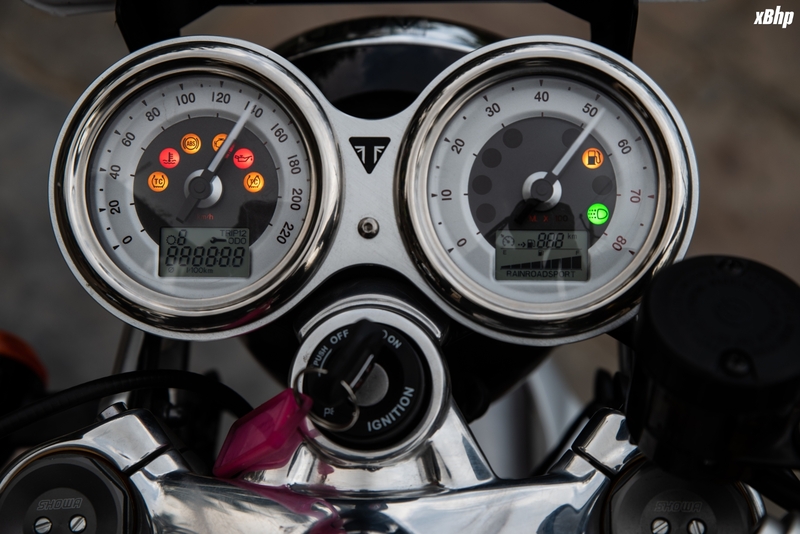 The twin pod instrument cluster is comprised of a speedometer and a tachometer. 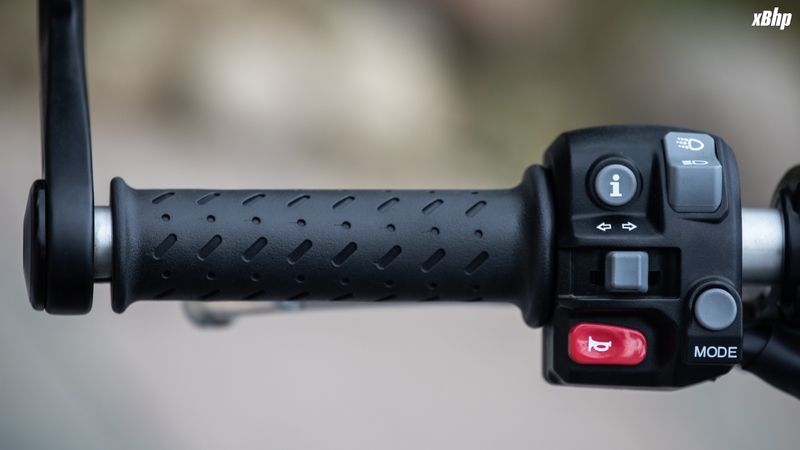 It also incorporates a digital menu system accessible through a handlebar mount scroll button. The classic instrument cluster is complete with gear position indicator, odometer, two trip meters, service indicator, range to empty, average and current mileage and a clock. It also features the access to turn off traction control or ABS. 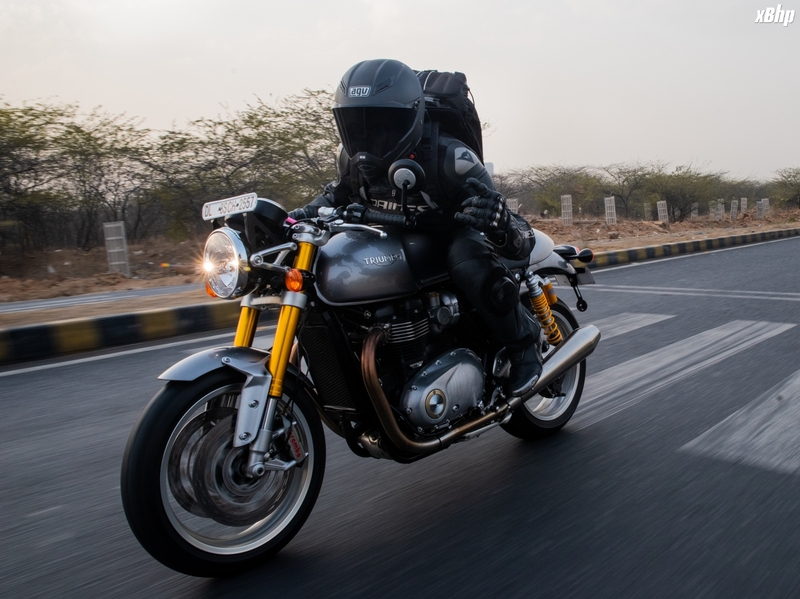 The Thruxton 1200R gets the same 1200cc engine as the Bonneville T120 but with a twist. 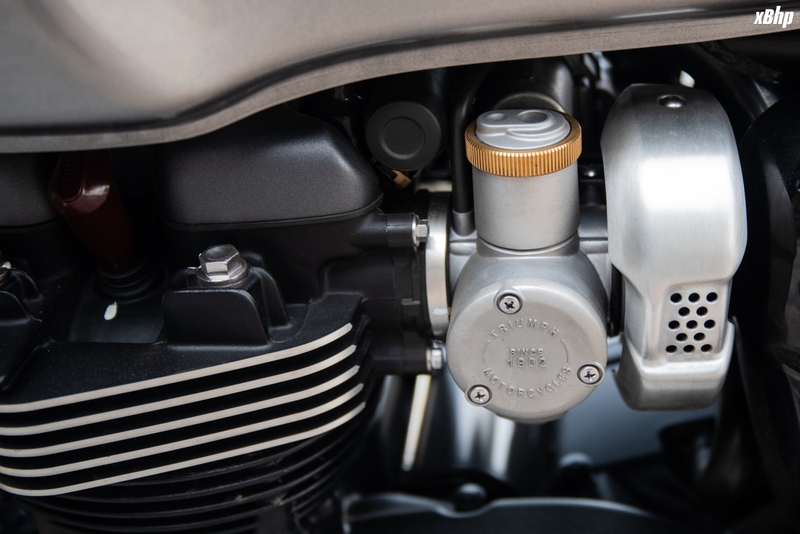 Unlike the ‘High Torque’ engine on the Bonneville, this one gets the ‘High Power’ variant of the 1200cc parallel twin i.e. 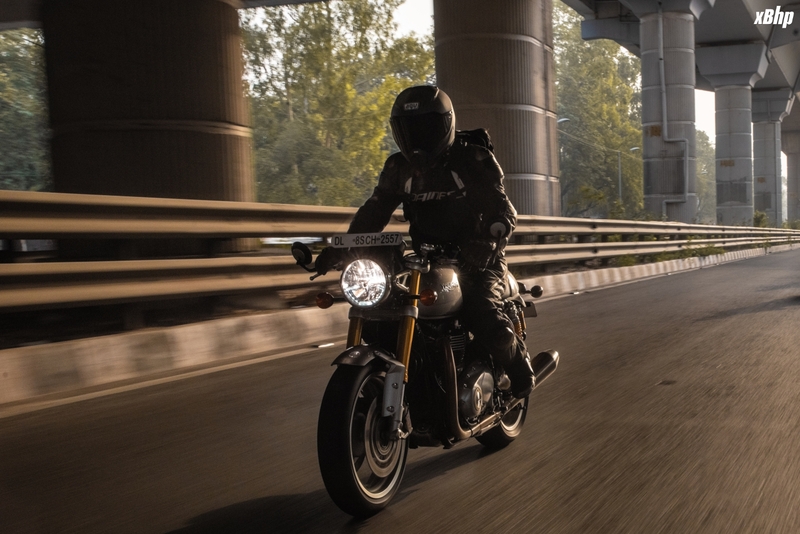 it has been tuned to match the characteristics of a café racer. 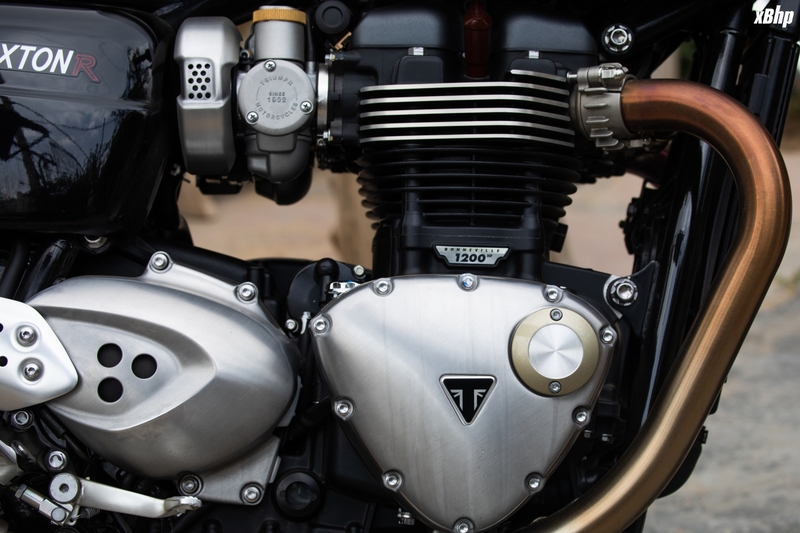 Thruxton’s engine also runs a higher compression ratio than the Bonneville’s engine. It produces a maximum power of 97 Ps at 6750 rpm and a maximum torque of 111.2 Nm at 3692 rpm. The power is transmitted to the rear wheel via a 6-speed transmission. 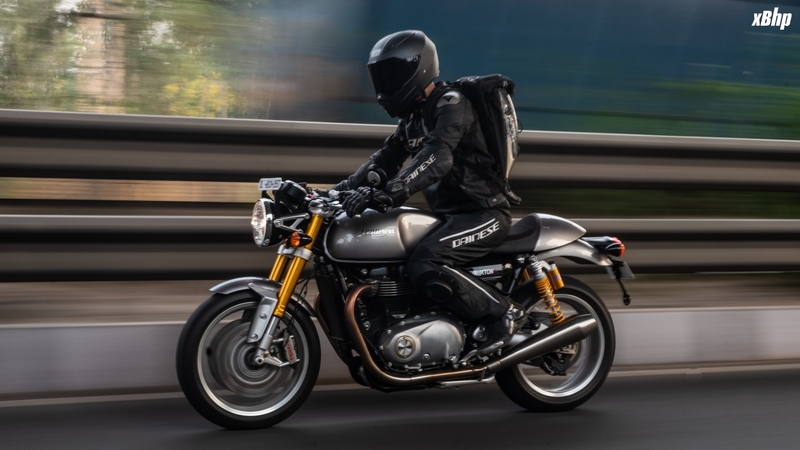 Thruxton 1200R is built upon a tubular steel cradle frame with a regular twin sided aluminium swingarm. 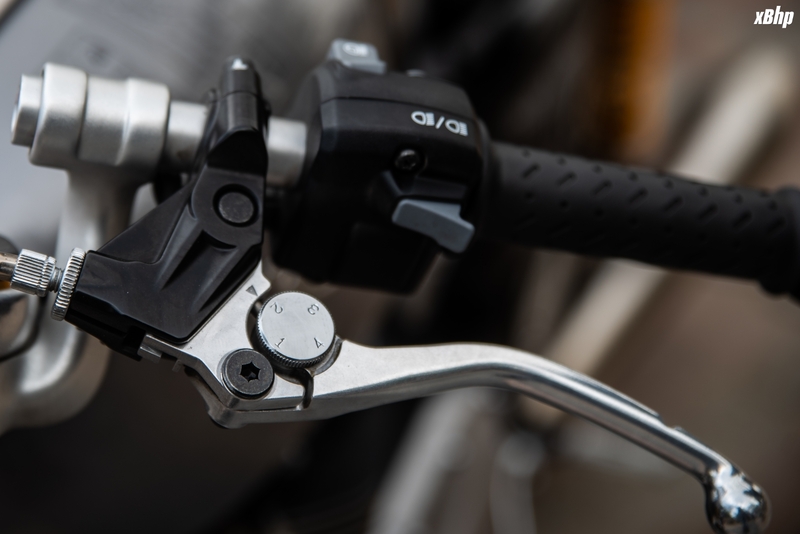 The front suspension is a top of the line fully adjustable Showa 43mm upside down big piston forks that offer a travel of 120mm. 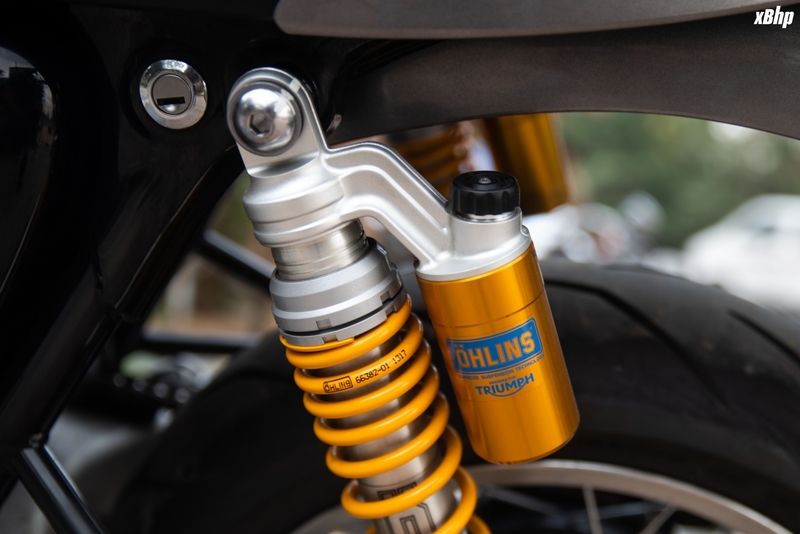 The rear suspension is no slouch either being a fully adjustable set of Ohlins twin shocks offering 120mm of travel. 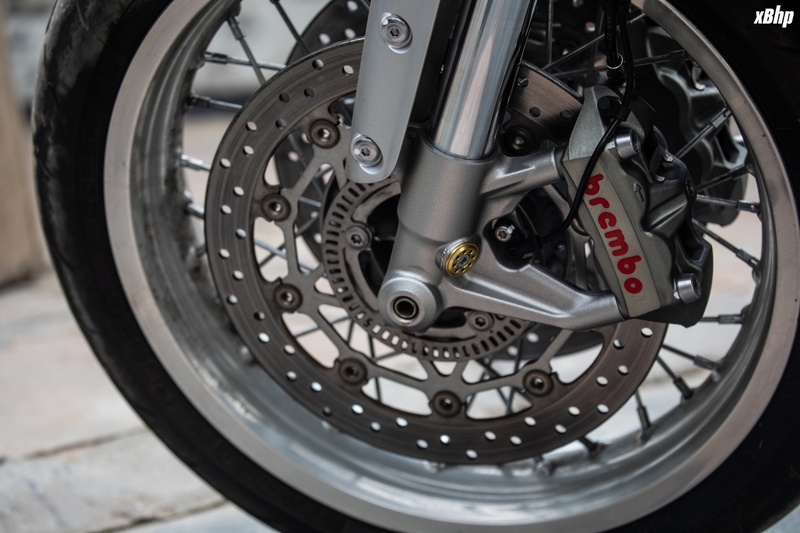 The top level componentry doesn’t end there as the front brakes are made by Brembo working on two 310mm floating discs and Brembo 4-piston radial monobloc callipers. 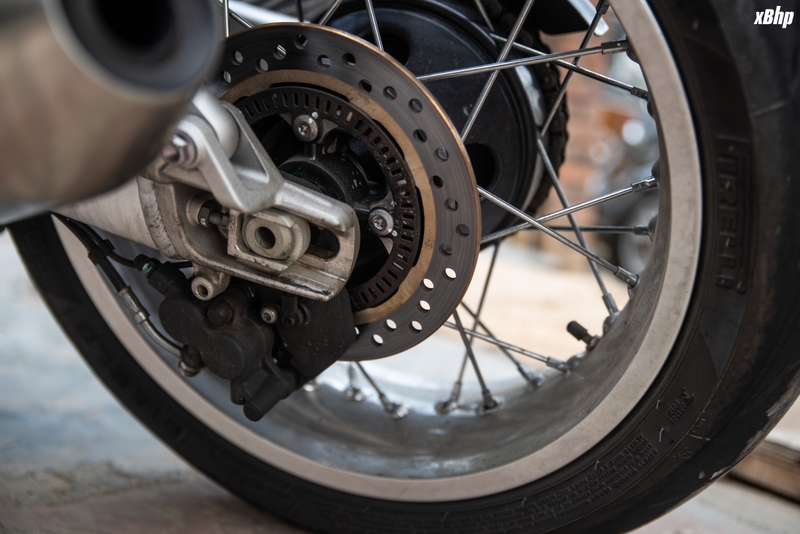 The rear is a single disc with a 2-piston floating calliper. Both are equipped with ABS that is switchable. 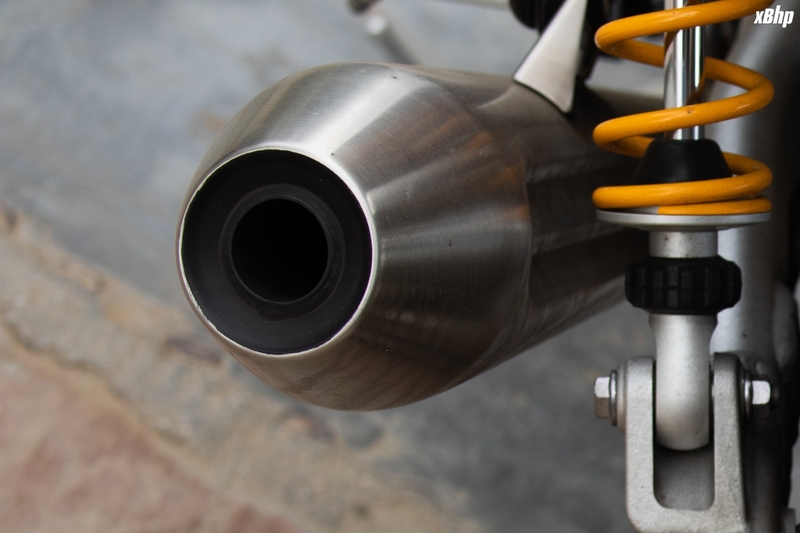 The motorcycle has a wheelbase of 1415 mm. 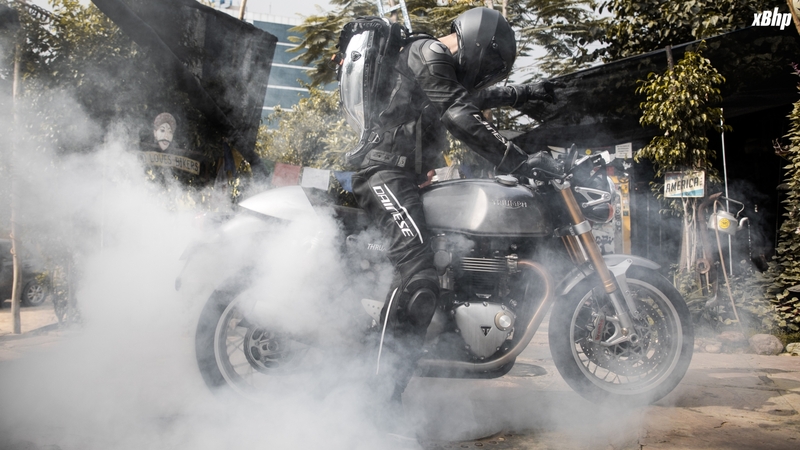 The Thruxton 1200R is not meant to be a tourer. It is not meant to be a track racer. However, can it be your only bike in the garage? If you are the experimental type who doesn’t mind trading comfort for exclusivity then by all means this can be your ride. This bike is one of the few which looks inconspicuous and different on the road at the same time; however for some strange reason I found it easier to ride fast than slow. The torque demanded it being pulled at every red light and dipped into every turn like I was on a race bike. 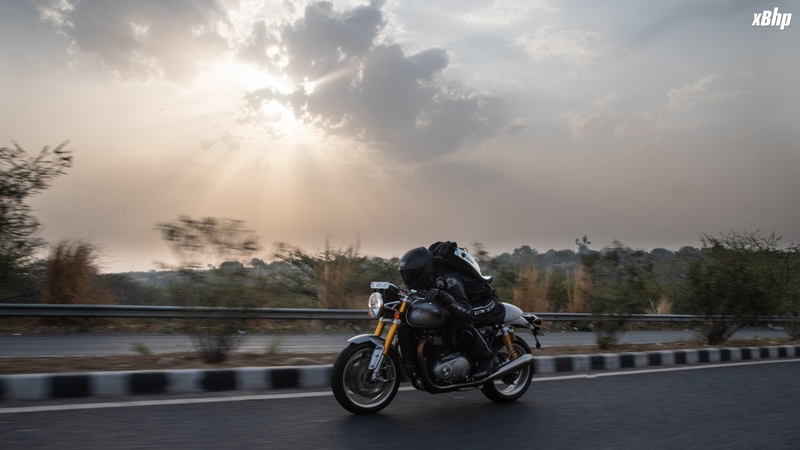 It will be a decent ride on good roads but might give you jittery bones on bad asphalt, especially since you have a bit of weight on your wrists. 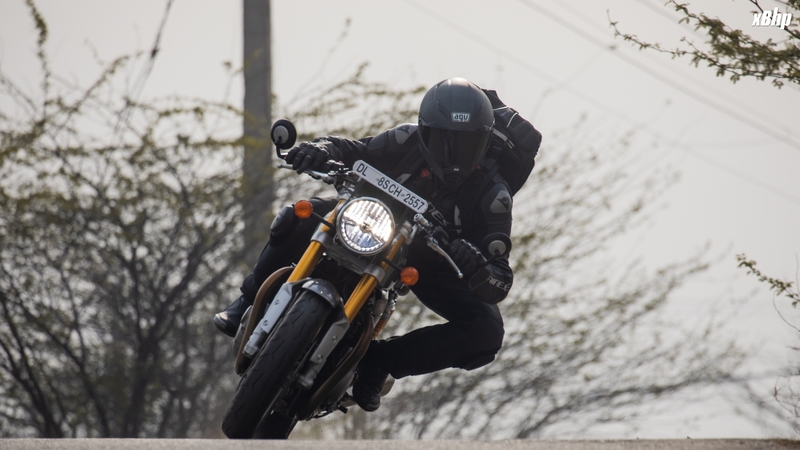 Just don’t expect the pillion to be too cooperative after a decent ride on this! 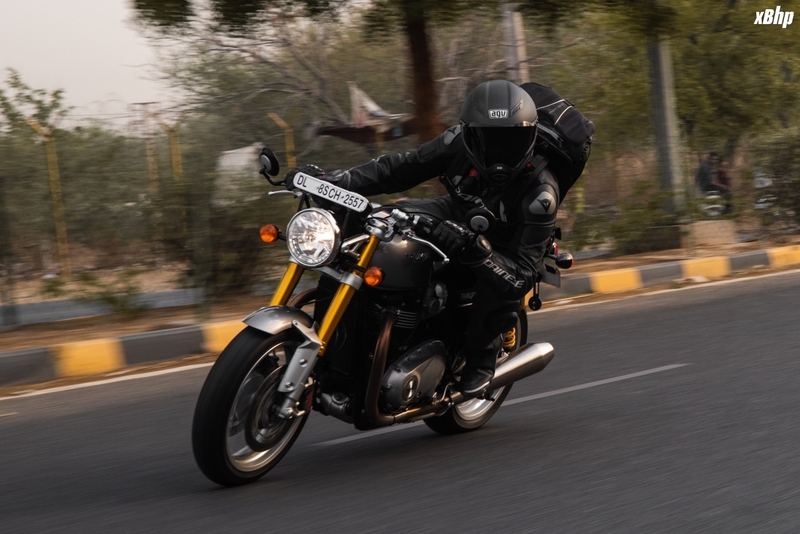 If you are a person who likes to stand out in a crowd, likes to ride fast, look good and doesn’t mind less luggage on a long trip then this is the bike for you. Being single already will also help. Last edited by NewsReaper; 06-06-2018 at 01:11 PM. bharatheshk and cyborgk like this. The KTM RC 250 Reviewed in Malaysia!